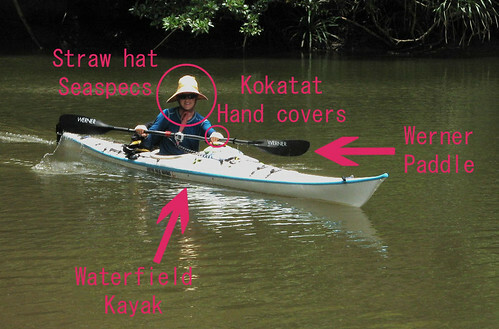 This is a small list of my favorite kayak gear, compiled while battling strong winds for hours and days in Iriomote. I would like to thank the various manufactures for making quality equipment. First of all, I would like to compare a kayak paddle to a violin bow. For those who don’t know, a high quality bow is essential to making a beautiful sound. Also, violin bows can be even more expensive than a good violin (likewise a good paddle comes at a steep price). A cheap or poorly suited paddle will give you wrist pain and make your paddling much more tiring. Imagine how many times you have to push and pull the paddle through the water during a long distance kayak trip. A great paddle will make it feel like you are waving a magic wand through the water magically propelling yourself forward. During our first long distance kayak trip around Iriomote (3 years ago), I constantly had sore hands and wrists. Of course my technique was terrible, but also my paddle was the cheapest paddle we could buy. We were new to sea kayaking and had already spent a lot of money getting set up with kayaks and all the various accessories. I continued to use this paddle and subsequently struggled during our trip from Okinawa to Amami Oshima. Finally I really wasn’t able to paddle anymore. I had so much pain. I decided to read up on alternatives to my present paddle. I found out that there are paddles made especially for small hands (I have very small hands). Strangely however, these paddles were not on the market in Japan (land of the small handed people??? )*I just got an email from my friend Saeko which notified me that these paddles are now available in Japan. I immediately ordered it from the States over the Internet and have loved it ever since (despite it's expensive price tag). It’s a WERNER paddle with a small shaft diameter- great for long distance touring, long days and steady strokes. It has a neutral bent shaft, which I think minimizes the stress on my wrists. The adjustable ferrule, makes for quick and easy assemblage. I generally have my paddle feathered at 45 degrees. I have never suffered from wrist pain since I have been using this paddle. One bad point is that it is not good for kayaking in strong winds and surf. Already I have broken one paddle in surf, and felt like I might break another one in strong winds that we experienced recently in Iriomote. Since the paddle is so lightweight it may be susceptible to fractures. I think the best combination would be to have this paddle with you during a trip, but also a backup, heavier stronger paddle for rough conditions. Rik has been using GARMIN GPS units for over 10 years. He claims that he is happiest with a GPS in one hand and me in the other. At times I even suffered from jealousy towards the treasured GPS, but now I have my own. Over the 10 years Rik has used GARMIN GPS units, drastic improvements have been made (still room for many). These units, which we use strapped to our kayak decks are encased in an AQUAPAC waterproof bag, are essential for navigating especially through channels in the reefs or during long crossings. It’s also great for checking speed/distance statistics. Prior to any big trip we make extensive detailed GPS maps using satellite pictures, sea charts, road maps, and any maps that we can get our hands on. Carefully we put all the information together to form the ultimate digital map. Anyone interested in having a copy of any of these maps, we would be more than happy to share. Please contact us for a free copy. 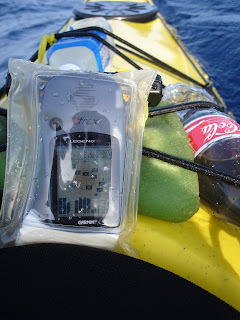 Despite what it says in the manual, the GPS unit is NOT waterproof, do not submerse it or use it without a waterproof case. Our sunglasses made by SEASPECS. These sunglasses are made with a built-in adjustable strap. They are supposed to float (THEY DON’T, as I found out the hard way). They are comfortable on my face, offer great coverage and even are polarized, which allows you to see into the water through the surface reflection. They are cheap and well made. These hand covers allow me to grip the paddle easily. There is often a problem with gripping the paddle if you use gloves while you are doing long distance paddles. My skin and hands are very sensitive and after days of being exposed to sun and salt water, I really appreciated these covers. They are very comfortable and never seemed to get in my way while kayaking. These kayaks are both great kayaks. 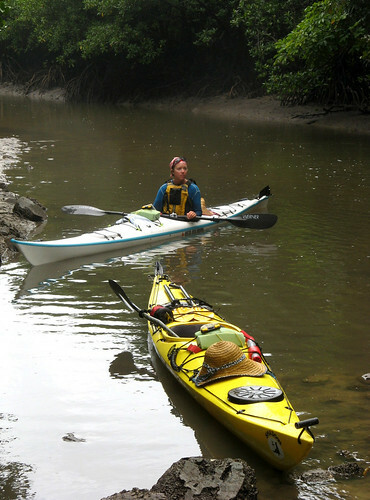 More than anything, however it is the match of these two kayaks during our long distance touring. The Shadow is a strong stable plastic kayak. The boat is very comfortable, and reasonably fast for a plastic kayak. You can land it almost anywhere without fears of destroying it. The Hayate is a Japanese-made FRP boat. These kayaks are hand crafted with great care and attention to detail in the city of Kumamoto near where we live. The boat is beautiful and very fast. Due to its sleek design, it is a little bit difficult to control, but with aggressive paddling it handles well. So far we have babied it, and do not make rough landings with it. It is well made and strong, but not as tough as plastic. Both of these kayaks have their merits and demerits, but what makes it ideal for us is the match of the 2 boats together. I (Leanne) am a solid kayaker, but realistically I do not have the strength and power that my husband (Rik) has. For this purpose I ride the fast sleek kayak, and Rik rides the heavy slower kayak. We are now able to travel at more or less the same speed. This makes long distance touring so much more enjoyable for both of us. I don’t always have to crank for all I’m worth and still be far behind, and Rik doesn’t have to always paddle at a catatonic speed. Another plus is that Rik can check out the landings safely in his plastic boat and then assist me in the landings. One more thing, perhaps my favorite and most treasured piece of equipment….my Japanese old lady straw hat. This wide brim hat (many a friends have ridiculed me for its appearance) is light weight, covers my neck, ties securely, is quick to dry, provides full coverage and is CHEAP and available anywhere in Japan. It is designed for farmers, and can be found in any agricultural goods store. Despite all this great, top of the line gear, after paddling for 2 weeks straight our bodies end up pretty battered. No amount of high quality gear can replace the necessary rest, stretching, massage and prior training necessary to make a successful long distance kayak trip. I still am struggling to find a few answers to great gear….for example truly waterproof bags, natural yet strong waterproof sunscreen (give up! There is no such thing!! ), comfortable, breathable, durable, women’s design touring shirt and shorts. I believe there is a big market for this kind of women’s clothing and I encourage anyone thinking of taking on the challenge of starting such a company to pursue it! I think that kayak gear is generally designed for men, regardless of the glaring statistics that show that the sport is gaining increased popularity among women. Any suggestions to good gear ideas would be appreciated. I want strong, good, high quality gear that can be beaten up and will still perform. I’m sick of crappy, cheap gear! If you have top quality gear, your kayak touring trips can improve ten fold. Don’t cheap out, and research everything well before you drop the big bucks! We are back home safely in Amakusa. "Nani yorimo bujidesu" is a Japanese expression that our friend Kenji likes to always say which means "Nothing is more important than returning home safely". During our 2 week holiday in Okinawa we were hit with no fewer than 3 typhoons. There really wasn't an ideal day for kayak touring. Despite not being able to accomplish our intended route, we did have a great time. 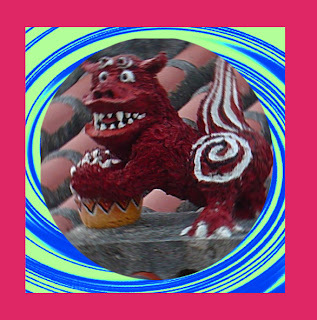 We were charmed by the many kind friends we made on our trip. Locals and travellers really seem to be intrigued and curious with our way of travelling. As before, we were especially enchanted with Iriomote Island's wild coastline, jungles and mangroves. Every day we went snorkeling. Strong wind and waves roughed up the sea surface, but we were able to anchor our kayaks, leave the misery of the surface, dive down and enter the crystal clear underwater world. It was just so great to be in such a clean environment, living outside for an extended length of time. It was wonderful to live with the rise and fall of the tides, the winds, the rains and the storms. We return to Amakusa feeling more alive and cleansed. Check back shortly for an indepth trip report! We're off on our summer kayak trip. 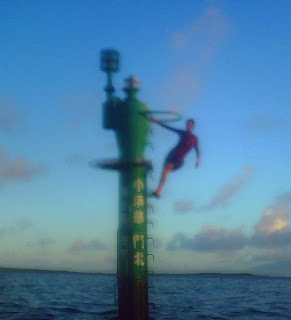 Destination: Yaeyama Islands, including Ishigaki, Taketomi, Iriomote, Yonaguni, as well as many other smaller islands. Can't wait to hit the road!!! All the last minute preparations are driving us crazy.